You may not recognize darkling beetles by name, but there's a good chance you've encountered these insects before. Their larvae are called mealworms and are often used as bait by fishermen. These beetles are common throughout North America and fill several roles in ecosystems across the continent. 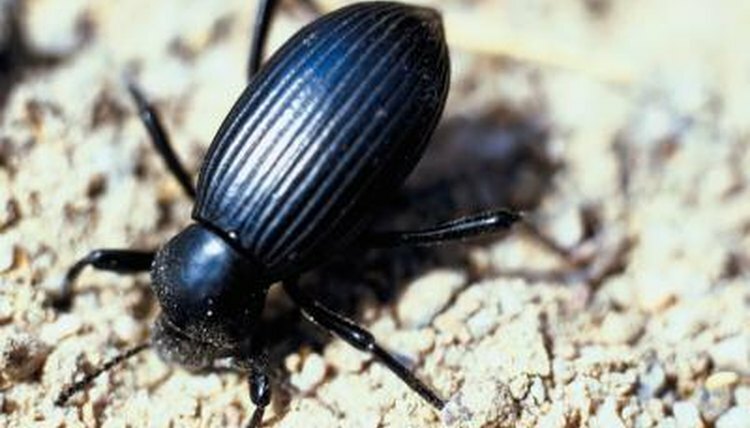 The term "darkling beetle" describes the thousands of different insect species that belong to the genus Eleodes. Members of this insect group are found in different habitats all around the world. Over a thousand species originate from the North American continent, but only about 150 of them are native to the United States, according to the Woodland Park Zoo. They are commonplace throughout their native ranges, so you can probably find one in your yard or garden if you look under a few rocks or fallen branches. The "wings" of the darkling beetle, called elytra, are permanently sealed together over their body. This renders them flightless throughout their entire life. Adults are 1 to 1.5 inches long and are covered by a smooth black exoskeleton. Their antennae may resemble thin threads or have a larger "club-like" tip depending on the species, according to the San Francisco Zoo. The larvae resemble worms, but they actually have six legs that help them move around. The larvae have rounded bodies with a cream to light-brown color. Perhaps the most fascinating characteristic of the darkling beetle is its ability to create water internally. The beetles don't need an external water source to survive. Instead their bodies fabricate it from other molecules. Darkling beetles are scavengers and decomposers. They eat dead leaves, rotting wood and other decaying plant matter. Mealworms are often found inside rotting stumps, logs and underneath rocks. They seek shaded and protected areas with a good supply of plant material to feed on. Darkling beetles may consume living plants, fruit, seeds and fungi as well. Adult female beetles deposit eggs in the surface of the ground. Once the small white eggs hatch, the larvae take shelter and feed for several months before crawling back into the ground to pupate. The mealworms may molt anywhere between nine and 20 times before developing into adults, according to the University of Arizona Center for Insect Science. Adult beetles can live for over 10 years, provided they are lucky enough to avoid predators for that long. Since darkling beetles are so widespread and numerous, they make a great source of food for various animals. Many types of birds, lizards and rodents eat them regularly. Spiders and other predatory insects also consume darkling beetles when given the chance. These beetles aren't designed for combat, but they do have one trick up their sleeve. When they are threatened, they raise their rear ends and spray a cloud of natural chemicals called quinones, according to the San Diego Natural History Museum. These compounds smell bad and discourage would-be predators from attacking the beetle.